In spring 1963, four years after the revolution in Cuba, the 36-year old Fidel Castro first visited the USSR . Diplomatic relations were established between Havana and Moscow in 1959. However, relations between the two nations' leaders cooled in 1962, when Nikita Khrushchev removed Soviet missiles from the Caribbean island following an agreement with US President John F. Kennedy. Castro claimed the Soviet leader did it all behind his back. 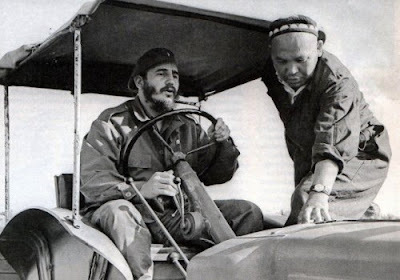 To improve relations with Cuba, Khrushchev personally invited Castro to travel to the USSR. 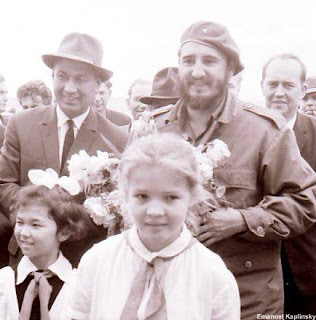 The visit lasted about 40 days, in which the revolutionary leader made an exciting tour all around the Soviet Union. 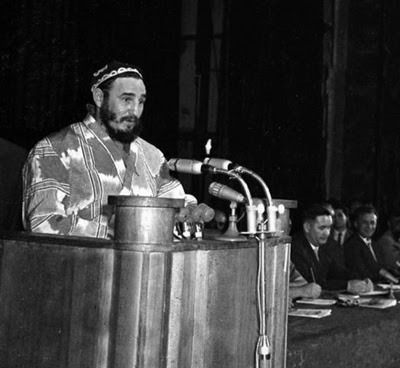 Compared to the grey-suited apparatchiks, Fidel Castro was like a rock star: young, handsome, dashingly dressed in his army fatigues. Crowds of Soviet citizens - young and old - thronged to greet him. In Uzbekistan he visited cotton farms, young pioneer groups and the impressive Golodnaya Steppe (also known as the Hungry Steppe). Begun in 1956, this was a Soviet agricultural project on a grand scale, to cultivate the naturally saline virgin lands, an area of 10,000 square kilometres in Eastern Uzbekistan, about 160 kilometres from Tashkent. 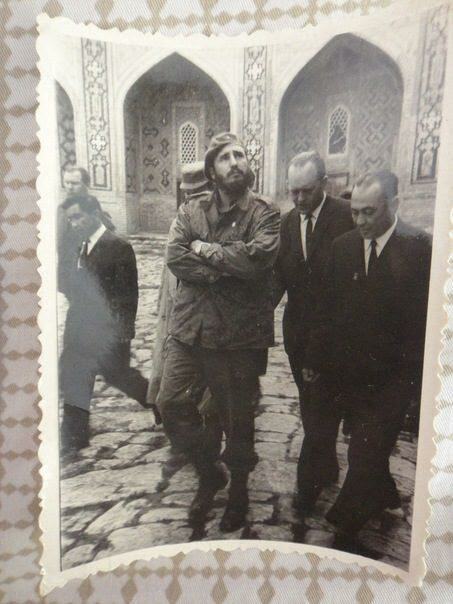 Castro also visited some of Samarkand's famous monuments. He made a point of spontaneous visits to ordinary working people, much to the chagrin of the carefully stage-managed Soviet program. There is another Fidel Castro - Uzbekistan connection. Sharaf Rashidov, the Secretary of the Uzbek Communist Party from 1959 until 1983, was hand-picked by Khruschev to head one of the most important Soviet diplomatic missions. Rashidov was highly respected because of his excellent communication abilities and tact. According to Open Central Asia magazine: "In the early 1960s, worried about the US deployment of military bases in Italy and Turkey, Khruschev was desperately looking for a counter balance against Washington. He eventually decided on Cuba. Following the economic blockade of the Cubans, Khruschev had to convince Castro to accept the USSR’s protection and benefits in exchange for permission to establish Soviet military bases on the island. According to Valentin Falin, a Soviet diplomat, the Cuban operation was highly confidential and only a few in the Politbiuro knew about it. In May 1962, the USSR delegation led by Rashidov was described in the media as a visit of “irrigators and meliorators led by the head of an agricultural, cotton-producing republic”. This was a cover up for the Western intelligence which was not supposed to know that the head of the cotton producing republic was secretly entrusted to speak with Castro and deliver the Soviet proposal to deploy missiles on Cuba in order to deter a possible US strike. The missiles and the personnel were supposed to be shipped on ships which would pretend to transport agricultural industry machines for irrigation. Given that such machines were produced in Uzbekistan, Rashidov’s leadership of the mission was not expected to raise suspicions". Note that there are seven parts of the film. For the remarkable Uzbek footage, scroll down to Reel 4 and watch the first four minutes.